The perfect hero isn’t always about perfection. Disney Pixar Cars 2 touches on this deep-felt need in everyone. A few weeks ago, my family and I got a hold of complimentary tickets to pre-screen Disney Pixar Cars 2 movie. It was our first trip to the movies as a family. Five year-old-TJ was fired up, ready to go. But, I knew it was risky taking two year-old CJ with us. I wasn’t too worried. I figured I’ll just take him outside if he started losing interest. I assumed he would get antsy halfway through. 1. I cared what happened to the characters. After 30 minutes or so, the cars all started looking more or less the same to CJ. But, I didn’t want to leave mid-way. So, I madly dug in my purse for anything to get him to stay seated. I managed to scrounge up some left over gummi bears. I started tearing and feeding them to CJ in teensy, weensy pieces, to buy more time. It was like sitting next to a ticking time bomb, but I made it across the finish line and got to watch the credits roll. 2. I am very sensitive to “car violence”. The original Cars movie was a sweet story about a car who finds his heart in a small town, away from the rat race of winning trophies and basking in the limelight. 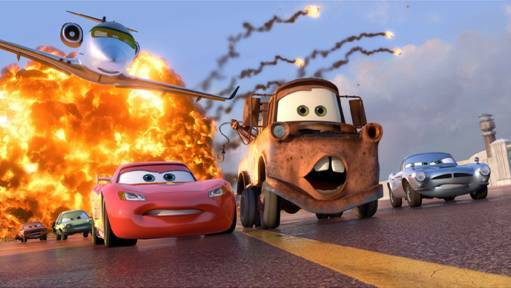 Cars 2 storyline takes us a world away in a Jame-Bond, spy and espionage plot, where the bad guys try to “kill” cars by blowing them up. The word k-i-l-l was used only two or three times in the movie, but I was horrified, worried my sweet boy lost his innocence. There was even a car torture scene! Fortunately, all this car violence flew past TJ and he never even mentioned it. But, beware. Post Cars 2, anything around the house that can be airborne will be launched as a missle or “shooter”. 3. I loved Mater as the hero. A lot of reviewers have been disappointed that Lightning McQueen didn’t have a more prominent role and don’t appreciate having Mater take over the movie’s plot. But, Mater has always been my favorite character, even from the original Cars movie. Mater isn’t perfect, but he emerges as the perfect hero in my mind because he values friendship, even if it comes with dents. Cars 2 doesn’t carry any spiritual messages, but God can use even a movie to draw us closer to him. That’s right. I answered. Jesus. 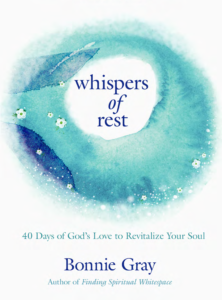 After Jesus was killed, the disciples locked themselves behind closed doors, filled with fear. Jesus appeared to them right in their moment of greatest hiding. And the first thing he did? Jesus showed them his scars. We all have “dents”, but we desperately want to get rid of them. But they show the world that we have risked to love others for Jesus. We can show our scars because Jesus is behind our story. Our dents make us real. God never wastes a good opportunity to show how His love and friendship for us underwrites every great storyline. Even if it comes from a rusty old tow truck named Mater from Radiator Springs. Do you find it difficult to show your scars? 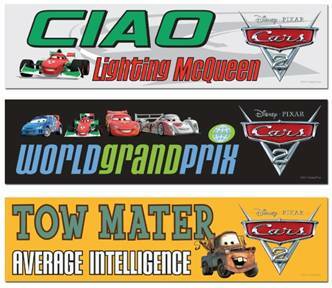 For all the Cars fans out there, Disney Pixar is hosting today’s giveaway! Share a comment by Noon PST, Friday 8/8. Scars? I have a bunch of them! The ones I have I protect very well from others but God told me one day to let someone know. It would be okay. This was one of the first times I think I heard and listened to Him. He was right. Over 3 1/2 years now I have let a few see my scars/dents and learned how to trust again. They haven’t walked away from me due to my past and present issues. Instead, the very one God sent to be his voice to me said “I will walk beside you as long as you need me too”… I didn’t believe her at first but she has kept her word, gained my complete trust, admiration and love. Letting her in and letting her see my scars I protected so well for many years, was freeing! She has helped me learn slowly about trust and has pushed me out of my comfort zone of hiding. Little by little, painfully slow to her I’m sure, she encouraged me to step out, reach out to others at my own pace and I learned how to be real with others. Dents and all! Now, all on my own, without many emails to this friend and weeks of counsel from her, I made a decision and stepped WAY out of my comfort zone! I will be joining our church on a short term mission trip to Joplin in August. This will be my first and I’m hoping it won’t be my last! I don’t know what God is doing in me or how he is going to use me and for the first time in my life, I’m okay with not knowing the plan! I’m just going because I feel like this is where he told me to go. And about Cars 2, we are planning on going to the drive in to see it soon! Mater & Jesus. That’s pretty awesome. We went to see this at the drive-in! Two of three kids loved it. Our poor middle kid (5) fell asleep. I didn’t think about how late it would start, but we had a good time. I liked the movie. I wasn’t sure about the spy plot, but it kept me entertained. We’ve been consumed by Radiator Springs since the first movie, and I still love it! 2 boys and 1 girl, and they have all loved McQueen and Mater! My seven year old son carry’s an eight inch scar across his belly from his battle with cancer. It used to be an oozing, bright red cut held together with flimsy looking medical tape. Now it is a semi-jagged, light pink track that wraps around his right side. Every time I see it, I can’t help but cringe….and remember what we both went through to keep Caleb earthbound. Once in a while, Caleb will lift his shirt to a random stranger and pronounce that he is a cancer survivor. They are speechless for a few moments, but then they begin with a few tentative questions. 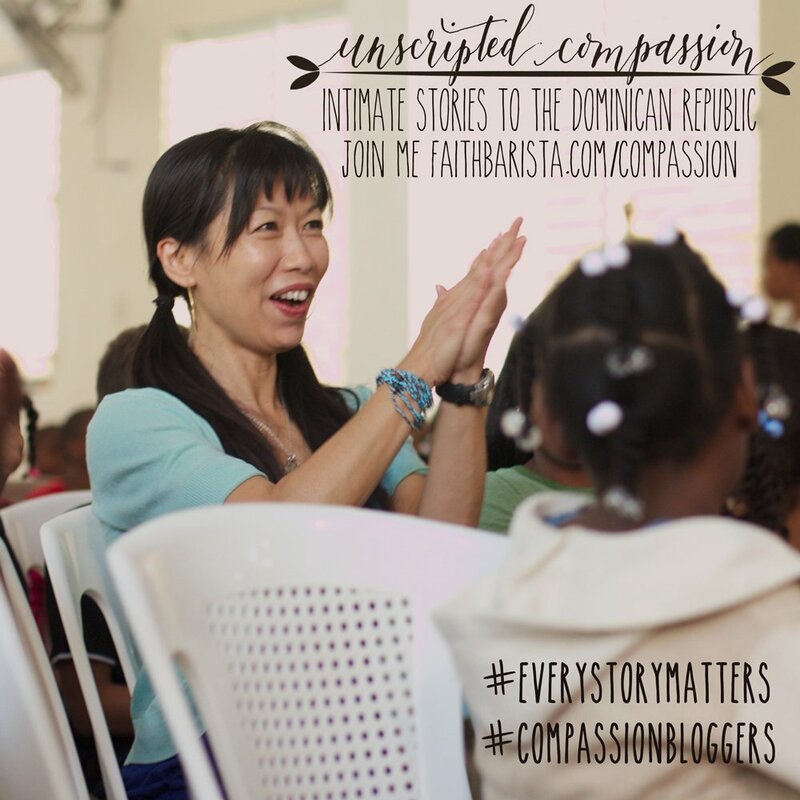 And we get to tell the story…..again…..and you better believe they will hear what God has done in and thru the storm. Scars weren’t meant to hide. Caleb gets it. Wow, that was awesome insight into the movie. I hadn’t thought of the scenes in that way. When we think about scars we all want to hide them so noone will know. We don’t want others to see we’ve been hurt. Even the hurt that a friend has caused. But Jesus wasn’t afraid to show his scars. And if we really have a relationship with him we shouldn’t be scared to show our scars either. It shows where we’ve come from and how far Christ has brought us. I want others to see that my scars are not holding me back but away to show others that with Christ all things are possible. We can show our scars not as defeat but as a trophy that our God can change pain into victory. Thanks for sharing! We saw it and it was great! We rarely go to the movies (once every couple of years on average), but made an exception for this one. My youngest (4) liked it but was overwhelmed with the noise of the theater. My 7 year old loved it. My 10 year old liked it a lot, but not to the “loved it” point. I was a bit bothered by all the violence – cars blowing up other cars, evil car meetings, the race to save Mater near the end, etc. It wasn’t anything worse than my kids have seen elsewhere, but it still bothered me. Maybe because it was CARS. This was also the first movie we’ve seen when my kids asked questions later about some of the things they saw. Which was good, in a way, but I hated that they had to ask those questions. The one thing I did appreciate was when things started to get tense, something funny would happen that eased all the tension. So while the bad moments were there, they weren’t long, drawn out scenes. And scars? Yeah, I’ve got ’em. I’m pretty good at hiding most of them. I used to hide them to keep them hidden. Now, I don’t share them unless I think there’s a need to. And most of the time, there’s no need to. I often hide my scars out of embarressment, fear of betrayal or rejection, and distrust in people. I hated the cars 2 movie. I was very disappointed in the violence and it was not appropriate or engaging for a 4 year old. I am looking forward to seeing this movie. 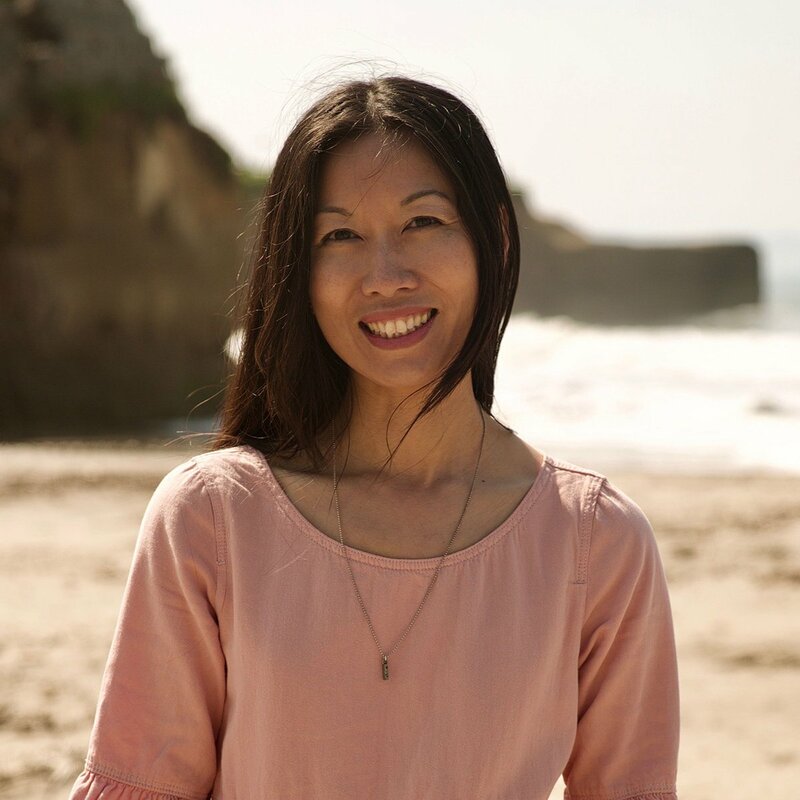 Thanks for sharing your insight on the movie…very encouraging and challenging! Haven’t seen it yet. My son is almost 5 and he loves Cars. But I’m worried about the missile situation. We are pretty anti-weapons in our house for now. So we’ll see …. we might wait until it comes out on DVD. Scars make for all the best stories. I’m secretly fond of my stretch marks too, formed as my belly swelled with growing babies. My son loved Cars and Cars 2. I was disappointed that Cars 2 was so violent, but most of it seemed to be over his head anyway. It was a rather complicated plot for the little ones. Mater was my favorite in the first movie. I want to see the second one also. (I don’t have kids so I don’t need any of the prizes, give them to someone else). I just wanted to say that you are so right about things ordinary, like a line from a movie, can show us the love of God. Scars are wonderful and I am finally accepting all of them. I posted “my story.” If you want to come over and read it sometime. It will show up in the link below. 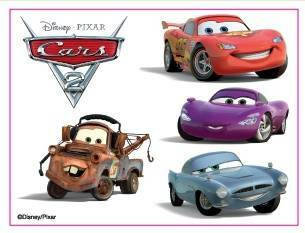 I haven’t seen Cars 2 yet, but I loved Cars! As for scars, I feel that I’m somewhere in the middle. At times it seems as if it’s almost TOO easy to share them; however, at other times, it’s like pulling teeth to be intimate and vulnerable in those areas! I do struggle sometimes with showing my scars but it gets easier the more I do it. I remind myself that it’s not about me but of God’s mercy in my life and sharing about His goodness. I haven’t seen the movie yet but would love to! I love mater! I thought your correlation with the dents/and scars was excellent. My husband is a missionary and took our 8 & 5 year old to see the movie last weekend before he left for a 3 week trip. 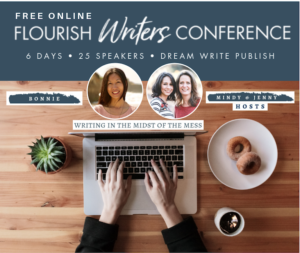 Can’t wait to share your blog with him. many blessings! loved your correlations. 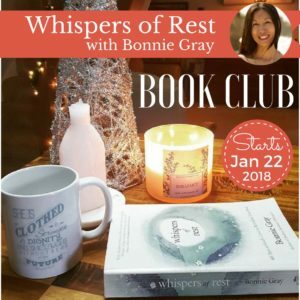 have heard so many negative reviews that I have been afraid to take my 2 youngest grands there, ages 5,6.. but now I think its ok… as long as we are prepared to talk about it before and after. 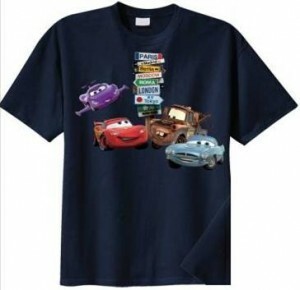 Both my grandson and granddaughter would love to have a cars tshirt!!! and both have upcoming bdays!. thanks for your comments.